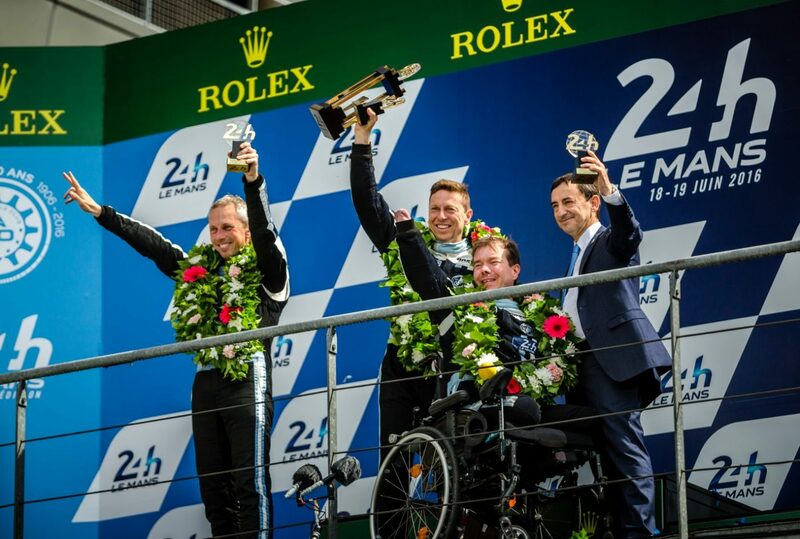 RACING THE LE MANS 24 HOURS IN 2016 “In July 2012 I was on holiday and I figured out I had a slight scratch, I caught an aggressive bacterium, within 48 hours it transformed into a fulminating purpuma, a serious type of severe sepsis. The awful property of this kind of blood-poisoning is to necrose very quickly the extremities of the body before damaging vital organs. I was put into an artificial coma, my prognosis for survival was seriously involved. Then, I was sent back to the Trousseau Hospital, in Tours, in the Burns Unit, in order to proceed to the amputation of my hands and legs above the knees. Some really difficult weeks of physical sufferings and psychological pains followed. I had to go through different hospital departments and at the end of October, with an iron will I started physical rehabilitation which has allowed me today to recover a maximum of autonomy, to walk again with prosthesis and even to drive again. Today, it’s only my everlasting passion for automobile sport which has led me to imagine that incredible project. This project is in the process of coming true and thanks to my SRT41 Association, you may support me to bring it to completion.” Helping me carry out this incredible project: why and how? SRT41 is a non-profit making association which enables generous sponsors to reduce their income tax of 66% of their donation. Racing the Le Mans 24 hours with a LMP2 prototype requires a high-tech equipment, a large team with highly skilled professionals and adequate facilities.By supporting this ambitious project you will have access to an outstanding global media coverage on the most covered automobile sport event of the year. But, you will also reach a social dimension, so far unknown, by providing a person with reduced mobility to accomplish a feat. To achieve this project, a high budget is necessary. An accurate and realistic study has been done and this forecast is available for consultation upon request. Support us to fulfill this dream, which is becoming real, take part in this incredible adventure.